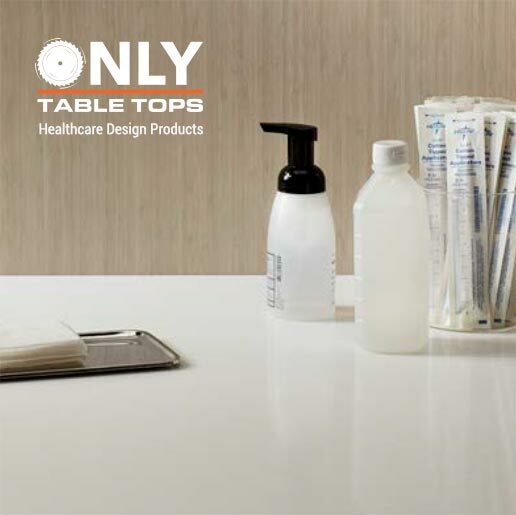 Only Table Tops and Wilsonart have put together the latest collection of Surfaces for Healthcare. The latest collection offers designers and architects nearly endless choices of colors and options that will bring about the change necessary to address the rampant spread of infection and illness throughout the healthcare system. With a heavy emphasis on beautiful natural materials and woodgrains, the latest in Solid Surfaces and High Pressure Laminates make a great pair for healthcare designers. Solid Surface is durable, non-porous, and NSF compliant, making it ideal for hospitals, eldercare facilities, doctors’ offices and food service areas. Available in 70+ colors and designs, Wilsonart® Solid Surface is ideal for any healthcare interior where you need a surface that looks good, performs well, and provides options that no other surfacing material can. Resistant to bacteria, stains, frequent and harsh cleaning procedures, and high traffic, Solid Surface makes the perfect choice for interior healthcare designs. It requires no surface sealants or costly day-to-day maintenance. And because it is renewable and repairable, slight scratches can be buffed away. Wilsonart Solid Surface complies with FDA food contact requirements and is safe for food preparation areas. Due to its inconspicuous waterproof seams, it’s easier to clean and keep free of mold and mildew. Plus, Wilsonart Solid Surfaces have also received UL GREENGUARD Gold Certification for low chemical emissions, ensuring that it won’t contribute to harmful indoor air quality. ✓ Limitless Design – Stunning natural stone looks in solids, small to large particulates, veining and movement, quartz-inspired sparkle, elegant inlays and an abundance of custom design options. ✓ Stain-Resistant – Non-porous material allows for low maintenance and stain resistance, so you can worry less about spills or messes and more about your creative vision. Unlike granite, no sealing is required. ✓ Eco-Friendly – Designed for indoor spaces, GREENGUARD Gold Certification gives you added assurance that Wilsonart Solid Surface meets strict chemical emissions limits. ✓ Seamless – Inconspicuous waterproof seams eliminate the growth of odor-causing mold and mildew. NSF compliant for food contact. ✓ Repairable – Easily repair scratches, chips, gouges or cracks to the original condition by a Certified Wilsonart Fabricator. *Solid Surface is 1/2” thick and has a max size of 30”x144”. Sinks are also available. The Solid Surface Healthcare Collection. 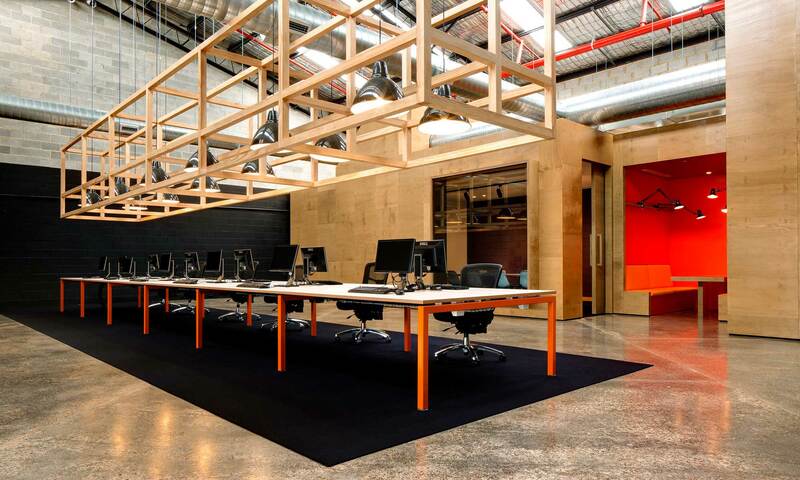 Wilsonart® High Pressure Laminate is made for outstanding durability. With the added HPL selections and options, you can create an ideal patient experience. Create a calming, homelike environment from over 300+ designs and 16 finishes. High Pressure Laminate works around the clock to support a positive patient experience. Wilsonart® HD® surfaces combine the most dramatic designs and textures with Antimicrobial Protection and Enhanced Scratch and Scuff-Resistant AEON™ Technology to produce the best laminate choices for healthcare countertops and work surfaces. Plus, Wilsonart High Pressure Laminates have also received UL GREENGUARD Gold Certification and meets standards for low emittance, recycled content and responsible forestry sustainable. Only Table Tops manufactures and ships HPL and Solid Surface table tops and surfaces in any size, shape, or color. We craft healthcare surfaces to your exact specifications. Browse the HPL Healthcare Collection. ✓ Aligned Textures – Aligned Texture is the latest innovation from Wilsonart, using synchronized texture and visual pattern for designs with striking clarity, richness, and natural beauty. ✓ Performance Plus – Design with confidence when using AEON™ Scratch and Scuff Resistant Performance Technology. Featured on Wilsonart® HD® and Premium designs, AEON outperforms competitive laminates with similar finishes on wear resistance, as well as scratch, scuff and mar resistance. ✓ Eco-Friendly – Designed for indoor spaces, GREENGUARD Gold Certification gives you added assurance that Wilsonart HPL meets strict chemical emissions limits. ✓ Innovative – Improve your surfaces with Antimicrobial Protection featured on Wilsonart® HD® designs. Antimicrobial Protection is built directly into the laminate to protect the surface against contagious microbes. ✓ High Wear – Low-cost and built to take the extra wear that comes with high traffic commercial healthcare design projects, Wilsonart® High Wear Laminate boasts more than five times the industry standard for abrasion resistance. 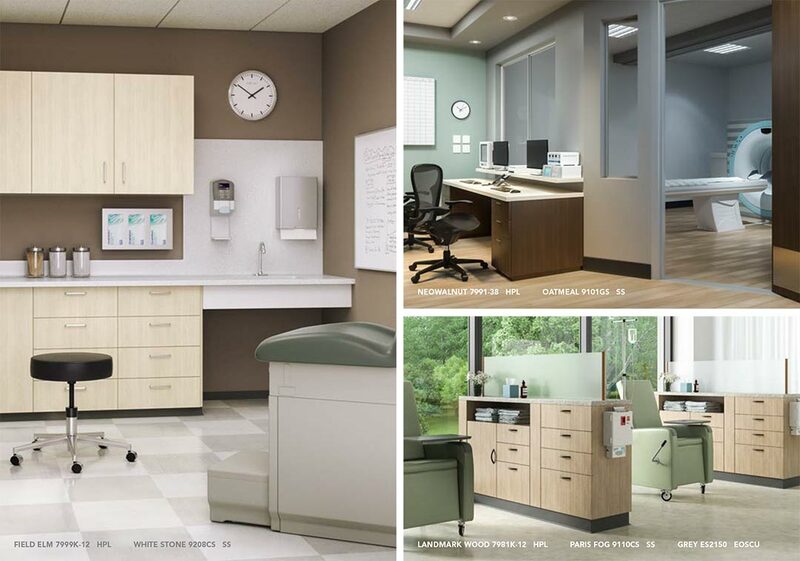 Browse The High Pressure Laminate Healthcare Collection. 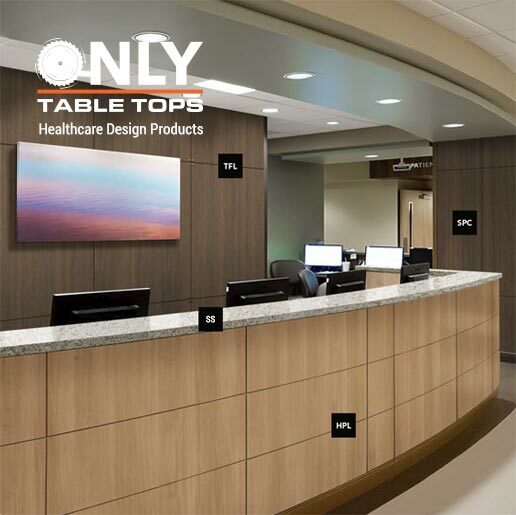 Healthcare Designers Choose Only Table Tops for Custom Healthcare Surfaces. A strategic blend of Solid Surface and High Pressure Laminate supports functionality, maintenance, and long-lasting performance. For patient-provider comfort and health safety, Wilsonart Healthcare Laminates are the preferred choice for architects and interior designers working on healthcare projects. Hospitals, doctor offices, dental offices and eldercare facilities all trust Only Table Tops for healthcare furniture parts, work surfaces, and table tops. Call 602-845-9334 to learn more or fill out a quote request here. With 3,200+ industry professionals at the Healthcare Design Expo & Conference, it’s the ultimate networking, education, and product-sourcing event for all healthcare designers and architects. We will be on hand to show you the latest technologies in healthcare surfaces. Learn more about the Healthcare Design Expo & Conference, and join Jacie and Drew from Only Table Tops November 10-13, 2018 in Phoenix, AZ. Next PostNext TFL and HPL – What’s the Difference?